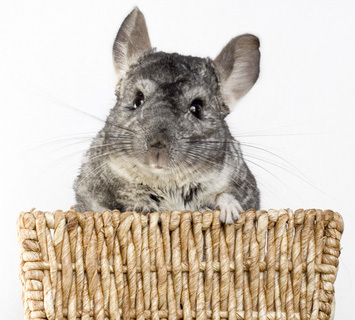 A chinchilla needs a safe home that gives him places to play, explore, and sleep. With the correct cage, bedding, toys, and other accessories your pet will enjoy his home and will be happy and healthy. Chinchillas are very social and do well in pairs and groups. Since they do need a lot of social interaction, having a pair of chinchillas is often better than just one. With more than one, their cage should be larger and they should have more than one of most of the items needed for their home. Chinchillas are active and like to run, jump, and play. You should get the biggest cage possible which will allow them plenty of room for their antics. The minimum size cage is 16″ x 18″ x 16″, but bigger is always better. There are many wire cages with solid floors that make excellent homes. Some cages have multiple levels for even more fun. You want to avoid cages with wire floors since they can hurt a chinchilla’s feet. You should also avoid glass tanks due to poor ventilation. Chinchillas are sensitive to heat, humidity, and drafts. Extreme heat can even cause heatstroke, which can be life threatening. They do not do well when temperatures go above 78º F. You want to keep the cage out of direct sunlight and away from heaters and other heat sources. You should also keep the cage away from drafts and places with high humidity. Chinchillas are also most active in the evening hours. Since they sleep quite a bit during the day, they should not be kept near brightly lit areas. Pelleted or shredded paper bedding is an great choice for a substrate. It is safe if your pet nibbles on the bedding and absorbs liquids and odors well. Bedding made from pine or cedar should be avoided. They can be sharp and painful to your pet’s feet and are sometimes dusty and may cause respiratory problems. A stoppered water bottle that attaches to the cage provides a steady supply of water. It also prevents water from being spilled and helps keep the bedding dry. A food bowl or feeder that will not spill is needed to prevent spillage and contamination of food. A hay rack is a great way to provide hay to your chinchilla. Hay racks keep the hay clean and dry. Hide areas are essential for your pet’s well being. They are safe, cozy areas where he can rest and feel safe and secure. Hide areas can be nest boxes, tunnels, or any other chew proof place where he can hide. Chinchillas are active and must have an exercise wheel in the cage. The wheel needs to have a solid floor to prevent foot injury. A chinchilla will often use a wheel at night so you should try to find a quiet wheel if the noise will bother you. Chinchillas are very clean and have almost no body odor. They maintain their soft, plush fur by taking dust baths. Commercial dusting powders and bins are available for their baths. Place dusting powder in a bin and let your chinchilla take a dust bath at least twice a week. You can remove the bin after the bath and save it for next time. Pet toys are important to keep a chinchilla from getting bored and to help keep his teeth worn down. There are many commercially available chew proof toys for playing and safe wooden toys and sticks for chewing. It is often best to avoid using pieces of wood or branches you find outside as chew toys. Some types of wood can be toxic or may have come in contact with pesticides. Chinchillas are very clean animals and do not like to be in a dirty cage. The bedding will most likely need to be changed at least once a week. Wash the water bottle, food bowl, as well as any items in the cage that may smell with soapy water. Make sure everything is dry before returning items to the cage.